Looking for a Specialist Precision Engraving Company? Machine and Laser engraving / profiling on Stainless Steel, Mild Steel, Brass, Aluminium, Bronze, Wood and various Plastics. For over 80 years, Alexander Pollock Ltd has been supplying bespoke, precision engraved products, to a variety of markets and has remained at the forefront of Engraving / Profile cutting technology. 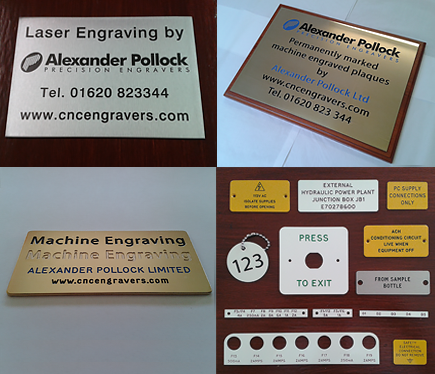 Utilising the latest CNC engraving machinery and software, Alexander Pollock provide a superior machine / laser engraving and profile cutting service, producing permanent marking on all plastics, metals, including stainless steel. 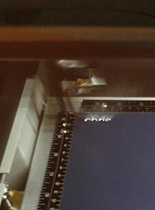 Whether you require a corporate sign, commemorative or memorial plaque, vandal resistant panel, control panel, specification nameplate, ID label, measuring gauge, or any other precision engraved / profiled part, Alexander Pollock provide a complete, bespoke engraving service, which is fully accredited to ISO 9001:2008. Corporate images, engineered graphics, English Standard Braille, calibration scales, custom profiles, as well as standard text, can be engraved onto almost any material. 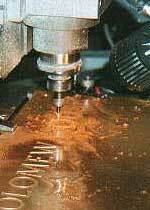 For a competitive, engraving quotation, please contact us on 01620 823344 with details of your requirements. We can engrave English Standard Braille, 0.5mm deep to current legislation, directly on to stainless steel door entry panels, plates, plaques etc.